Twin strollers are essential for families with twins or toddlers and newborns. There are different brands and models of twin strollers giving parents a lot of options. Baby strollers are essential for families with infants and toddlers. Because there are different types and brands of strollers, it can be challenging to shop for the right one to use particularly if you have twins. These are factors that parents should consider to help them shop for the best double strollers for their babies. Tandem or Side-by-Side Baby Stroller? Before shopping for a twin stroller, parents should determine what type of stroller would suit the family’s lifestyle. Tandem and side-by-side baby strollers are perhaps the most common types of twin strollers. Tandem stroller features a seat which is located in front of another. Because of the position of the seats, this type of twin stroller has a narrow profile making it easy to navigate through grocery and store aisles. It is also one of the most affordable types as the models start at around $100. New tandem stroller models accommodate baby carriers which makes it convenient for parents to transfer the babies from the car to the stroller while they are sleeping. While tandem double strollers work well for strolls in the park, it is not ideal to be used in grassy areas or rough terrains. There are also parents who complain that it is not great in handling and cornering. However, its advantage is that it is easy to fold up and store. Tandem strollers are preferred by parents who have a toddler and an infant. The baby can stay at the back seat while the older one can stay in front without bothering the baby with movements such as kicks. Side-by-side strollers feature seats that are beside each other. The seats can be fully reclined making it easy for babies to take a nap. It can also be folded up compactly. 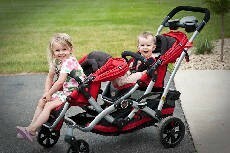 It is wider than tandem strollers because the seats are side by side but it is the lightest type of twin strollers. Its two front wheels are bigger and these allow the stroller to provide a smooth ride and easy navigation. When twins become toddlers, they will be able to easily get in and out of the stroller unlike in tandem strollers where the one in the back might get stuck. Perhaps the only drawback of side-by-side double strollers is its width. Because its average width is 30 inches, it can be difficult to navigate it through stores and malls. There are also brands that are trying to slim down the strollers to make it more attractive to consumers. However, this will make it uncomfortable for babies and toddlers who are larger. A stroller seat that can be used as a car seat would be convenient for parents who are on the go. When you have twins or a toddler and a newborn and you need to run to the store, it can be time consuming to put your kids in their car seats and transfer them to the stroller and back. There are many twin strollers today that have the ability to snap car seats directly into the stroller. If you will be going out often, you may want to consider getting this type of baby stroller. The weight of the baby stroller is important as you will be lifting it often to get it in and out of house and car. The width is also just as important as the comfort of your trip to the park or store will depend on it. If you will go to the store with your babies, you would want to make sure that you can go through aisles with ease and that the baby stroller will fit the main entrance of stores. The wheels are perhaps not the most important factor to consider. However, it would be a good idea to find out if the wheels swivel as this will allow for better navigation. This is also important in keeping the stroller from getting stuck. You may also want to look for wheel locks. The stroller’s front, back or individual wheels can be locked depending on the model. This will be helpful particularly if you need to park the stroller. The locks make sure the baby stroller will not roll down when you are on slope surfaces. This is more of a personal preference. If you will be traveling often, you would definitely want a double stroller that you can fold up easily. Most twin strollers are folded in half while some are folded in three. There are parents who are hesitant to get one that folds in three but it is in fact quite easy to use. It will only take seconds to fold the stroller and put it in your home or car. While it might seem like a good idea to buy the latest model of double strollers, it is important to keep in mind that function should precede style. There are parents who buy a model of stroller because it was in the latest fashion magazine. However, it is best to find out more about the model by reading reviews in magazines and online. Because you will be paying hundreds of dollars for a twin stroller, you would want to make sure that you will buy the best model for your twins. Consider your budget before buying a twin stroller. Determine how much you can spend for this baby essential. Because its prices vary depending on the brand name and its features, you should be willing to spend hundreds to thousands of dollars for the best one. There are consumers who prefer to buy baby strollers online. However, it is advisable to go to a retail store and check out the stroller personally. You may want to take a look at its basket and seat size, cup holders and fabric. This will help you determine whether or not your babies will be comfortable in it. It is also a good idea to take a spin around the store. You may want to make sure it corners well and that the baby stroller is strong enough to carry your babies, their baby bag and other essentials. Strollers are very useful for parents most especially when we need to bring our babies outside for a walk or we need to travel.